While it can't be said that we all came out to Montreux, on the Lake Geneva shoreline, we did certainly come down to the water: To the St-Lawrence river just past the Jaques Cartier bridge in Montréal, in our case. It was a gorgeous summer evening, with a full moon just rising over the south shore. We were not alone: Thousands emerged from the metro and took position along the riverfront. The bridge overhead was closed to traffic, and equally mobbed. In the distance, on Ile Ste-Hélène, the stage lights of the Osheaga festival could be seen. That performance, however, paled compared to what was about to erupt right in front of us. At 22h sharp, we put on our headphones and tuned in to the right radio frequency for the soundtrack. And then, the sky exploded with lights: Another contestant in the international fireworks championship had fired his opening salvo. 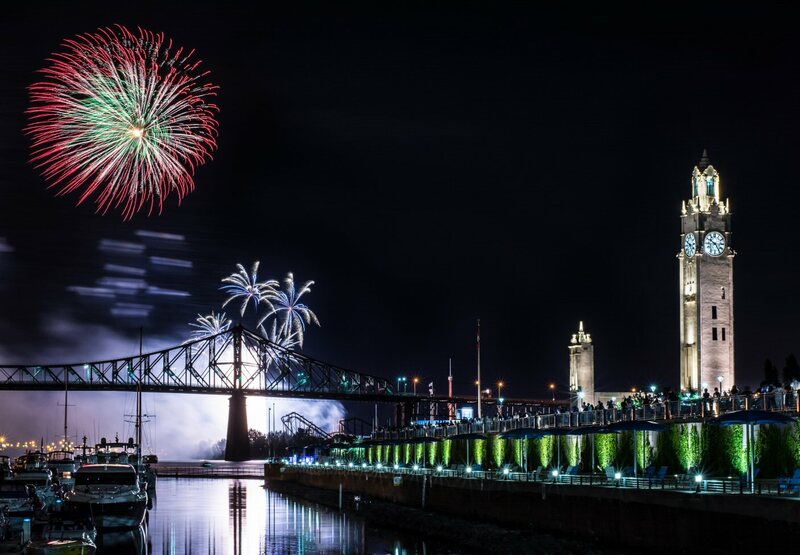 For over a month every summer, Montréal is treated to weekly fireworks displays. 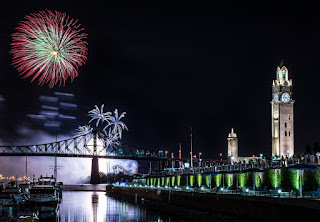 Launched from the La Ronde amusement park on an island in the river, they can be seen from across the east of town, and they always draw huge crowds. Participating companies chose their own musical themes, and showcase a bedazzling array of visual effects, colors and timing to match the fireworks to the sound. Pessimists could have been reminded of CNN's legendary coverage of the Gulf War, but positivity dominates in Montréal, and people were having a jolly good time. Every single Saturday. When Zurich has a 30min fireworks show for two evenings every three years during the city's Züri Fäscht, the talk of the town is typically centered on the million-dollar price tag and the amounts of heavy metal residues in the ecosystem. In Montréal, nobody thinks twice about cost, no Funky Claude was running in and out and no one burned down the gambling house - a good thing, given that Loto-Québec, and therefore by extension the slot playing part of the population, funds the extravaganza. This relaxed attitude and momentary indulgence in a folly of smoke and lights seems an apt reflection of Québec culture: No matter what we get out of this. The Swiss could take a page out of such open-hearted generosity. While this year's competition patriotically started with a "salute to the troops" on Canada Day, the finale was kindly set for August 1st - Swiss National Day. So here we stood, music in our ears, and a complimentary light show in front of us that made anything launched back home look like child's play. Life was good.